BSL3 Biocontainment Facility consists of two large laboratories each with 3 work spaces built around biosafety cabinets. Biosafety Level 3 (BSL-3) agents are those requiring containment of airborne bacteria, viruses, or toxins, therefore the design and administration of the BSL3 Biocontainment Facility follows strict federal regulations with local oversight provided by the NCSU Institutional Biosafety Committee. These and other factors assure the community that infectious disease research will not result in occupational hazards for the occupants of the research building. The BSL3 Biocontainment Facility is available for use by the NCSU community. What is a BSL3 Biocontaiment Facility? The Centers for Disease Control and Prevention (CDC) classify biomedical research into four levels. “BSL3” stands for Biosafety Level 3 and biocontainment facilities designated as such are specifically designed facilities employing safety equipment, and strictly enforced procedures to utilize agents requiring containment of airborne bacteria, viruses, or toxins. Therefore, the administration of the BSL3 Biocontainment Facility follows strict federal regulations with local oversight provided by the NCSU Institutional Biosafety Committee. Who can utilize the BSL3 Biocontainment Laboratory? The BSL3 Biocontainment Facility is available to the NCSU community upon completion of a Biological Use Authorization for biological agents and recombinant DNA through the NCSU Institutional Biosafety Committee, as well as specialized training for use of the facility and all required paperwork is completed. How do we gain security access to the building? For NCSU investigators who have previously not had access to the Research Building, a security badge (“prox” card) is necessary to access the building. A request form must be submitted to AllCampus Network at 83 West Dunn Building, NCSU, with approval from the office of the Dean of Research, CVM. Activation to gain access to the BSL3 Facility will be contingent upon completion of training. 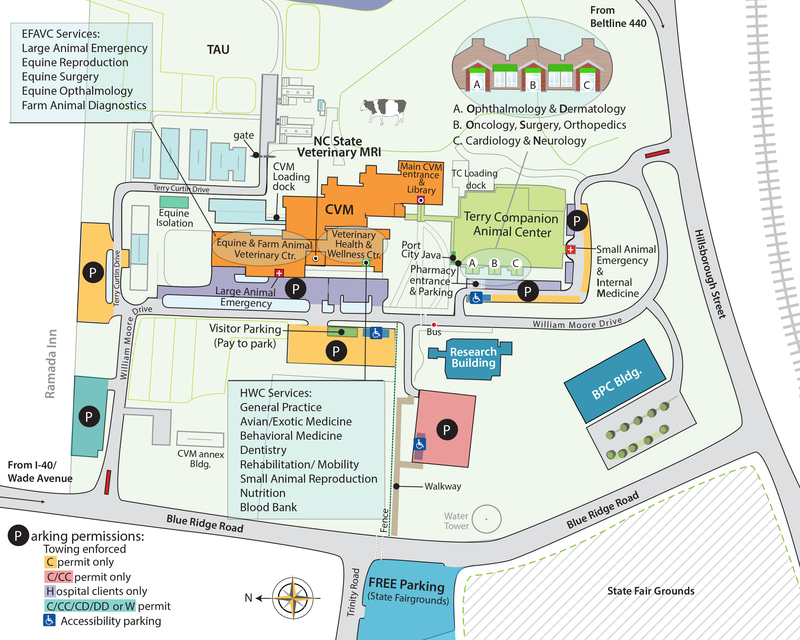 Parking in CVM lot is by NCSU permit (C) only. To obtain a day permit, go to the receptionist desk in the main CVM building, and obtain a pass. Note, this is limited to hours between 8 and 5:00 when receptionist is at desk. For directions to the CVM campus, click here. How is lab space assigned? Final approval and authority for assignment of space resides with the director of the laboratory facility. Assignment to 440 lab is based initially upon the type of agent being used. What equipment is available in BSL3 Containment Facility? Within the lab there are three Biosafety Cabinets, one Class II B2 and two Class II A2s. Selection of BSC #1-3 within the lab and accompanying lab bay should be based upon expected needs for chemical fume hood, vacuum and gas hook up. If chemical fumes will be generated or radiation used, BSC #1 should be selected as this BSC is a Class II B2 with exhaust ducts hard ducted to the exterior of the building. If removing liquids with the aid of vacuum is important, BSC #1 or #2 can be selected as both are hooked up to building vacuum (and gas). BSC #3 does not have gas or vacuum hook up so all liquid removal should be by means of pouring or pipeting into standing disinfectant trap without the aid of vacuum. Scheduling or reserving space in the labs will be by means of calendar. Signing up constitutes billable commitment unless reservation is changed at least 1 weekday prior to scheduled work day. Each BSC, once reserved, is available for your use for the whole day. Is there usage cost and how is the billing done? Please call for current use rates. Billing for use of the BSL3 Facility will be based upon calendar reservation and swipe card records for the inner doors leading to the main lab space. Billing will be based upon actual usage to include time involved in training and assessment. What is the procedure for accessing the lab area? Access to antechamber and to main lab space is by swipe card. Each individual entering must swipe. Allowing others to enter without individual authorized swipe card must be approved by Facility Director or Manager. The log is to be signed whenever entering main lab space (not antechamber). Reconciliation of log and swipe card records will be made monthly. Failure to log in properly will be documented and may lead to revocation of access authorization. Does antechamber access need to be scheduled in advance? Access to antechamber is not limited to reserved days. Investigators may enter to unload autoclaves or to store supplies (in lockers or in antechamber). Is freezer space available for storage? Ultra low freezer space will be assigned to investigators by shelf. Those wishing to use racks should provide racks that will fit in space that is 9.5” high and 23.5 “deep. For securing select agents, racks with locking device can be purchased from Phenix Research Products.